Workman Publishing Company, 9780761156109, 11pp. A warning: "You should never monkey around with a Beastie!" 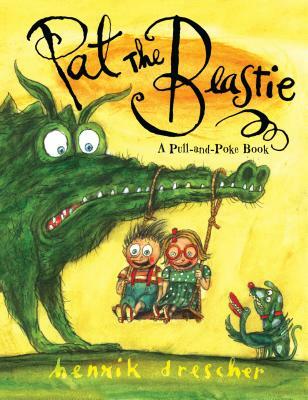 Once upon a time a little boy and girl named Paul and Judy had a pet called Beastie. Unfortunately, Paul and Judy weren't very nice to Beastie. In fact—they were downright naughty. They pulled Beastie's fur and jiggled Beastie's eyes. They tickled his feet and plucked his boogers. "Always be kind to your pets!" they were reminded again and again—but Paul and Judy never listened. Boy, were they sorry! Artist Henrik Drescher's decidedly wicked parody of Pat the Bunny, is back in a sturdier board-book format and more engaging illustrations. Pat the Beastie is an interactive touch-and-feel, pull-and-poke book that comes with pop-ups, squishers, squeezers, and squeakers—not to mention two brightly colored wormy boogers. Readers will love to join in with the mischievous Paul and Judy as they have fun "playing" with their pet Beastie, squishing and jiggling and playing peekaboo. (Hey, Beastie deserves some respect!) But after readers see what happens when you cross a Beastie—then he'll FEASTIE!—they'll go scrambling back through the book to make amends. Henrik Drescher, an illustrator whose work regularly appears in The New York Times Book Review and other national and international publications, is the author of Pat the Beastie and other children’s books, including McFig and McFly: A Tale of Jealousy, Revenge, and Death (with a Happy Ending); Hubert the Pudge: A Vegetarian Tale; and The Strange Appearance of Howard Cranebill, which won The New York Times Best Illustrated Book of the Year. He splits his time between Toronto and China.